Hello, Gavin here again. 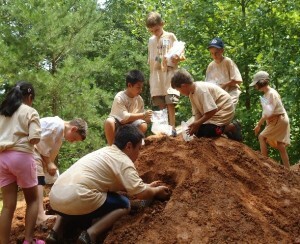 Today at The Original Curiosity Camp we are looking at the Rock Hounds Summer Camp. You might have guessed from my last blog when I said we’re going to have a ” rocking “day you rock. Well for Rock Hounds today I cant put any new photos since they are on the rock trip to the Emerald Gem Mines in Hiddenite where they go sluicing for gems, surface mining and sifting rocks out of the creek. This is a wonderful place for all your rock needs. Fun Fact: Hiddenite is a very rare rock that can be found or bought at Hiddenite. If you’re looking to go .its about a 2-3 hour trip from Charlotte to get there. As you can see these kids are wearing special shirts. These shirts are dyed with red mud. Every kid that goes to Rock Hounds gets one of these shirts but the trick is and why they are so special is because the kids that have these shirts design them themselves with rubber bands and red mud. These shirts start out white you know. Ohh someone was just killed. Well lets find Who Dunnit?